Bringing your favourite entertainment to life, Hisense is renowned for offering televisions that will allow you to enjoy an exciting range of smart features including impressive Ultra HD visuals, catch up services, 4K streaming services, high speed connection and outstanding levels of clarity. So if you’re looking to upgrade your home entertainment system, you're in the right place, as a Hisense television is sure to fulfil your needs. 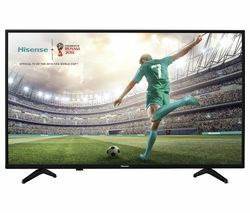 Within our collection of Hisense televisions, you will find a fantastic range of products including the Hisense H65N5300UK 65" Smart 4K Ultra HD TV, the Hisense H43N5700UK 43" Smart 4K Ultra HD HDR LED TV, the Hisense H50N6800UK 50" Smart 4K Ultra HD HDR LED TV and the Hisense H49N5700UK 49" Smart 4K Ultra HD LED TV. One of the most popular Hisense televisions within this range is the Hisense H55N6800UK 55" Smart 4K Ultra HD HDR LED TV. Boasting 4K ultra HD HDR, catch up and 4K streaming with Vidaa U, exceptional picture quality, optimum connectivity and Freeview HD with Freeview Play, this TV delivers all the latest functionality and a stunningly immersive viewing expereince. Offering sharp and realistic images, this Hisense television has also been designed to maximise contrast and colour accuracy in order to deliver a memorable, distinctive and enjoyable viewing experience. If you’re having any problems find a Hisense television that meets your requirements, please do not hesitate to get in touch. Our friendly, helpful and knowledgeable team is always on hand to point you in the right direction when it comes to finding a product that fulfils your needs. If you can’t find a Hisense television that works for you, don’t worry. We provide lots of other smart TVs from some of the industry’s leading brand names including many Sharp TVs and Blaupunkt Tvs.